Memorial in the Auckland War Memorial Museum for those who died, both European and Māori, in the New Zealand Wars. 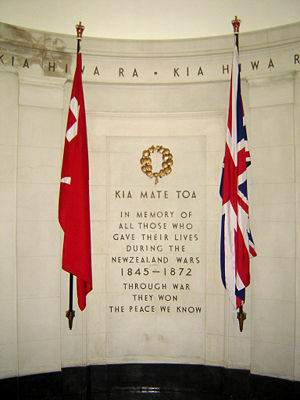 "Kia mate toa" can be translated as "fight unto death" or "be strong in death," and is the motto of the Otago and Southland Regiment of the New Zealand Army. The flags are that of Gate Pā and the Union Flag. The New Zealand Wars, sometimes called the Land Wars and also once called the Māori Wars, were a series of conflicts that took place in New Zealand between 1845 and 1872. The wars were fought over a number of issues, most prominently Māori land being sold to the settler (white) population. The Treaty of Waitangi, signed in 1840, guaranteed that individual Māori iwi (tribes) should have undisturbed possession of their lands, forests, fisheries and other taonga (treasures). Some early colonial land-sale deals had had a dubious basis, and the parties involved sometimes concluded sales before the signing of the Treaty. To avoid such situations happening again, the newly constituted British colonial authorities decreed that Māori could sell land only to the Crown (the Right of Preemption). However, many settlers did not appreciate that Māori owned their land communally and that permission to settle on land did not always imply sale of that land. Under pressure from settlers, the colonial government gradually ignored the provisions of the Treaty of Waitangi and permitted settlers to settle in areas that had uncertain ownership. Māori began resisting the occupation of their land by British settlers, and the whole process sowed the seeds of eventual war. When cultural spheres meet, misunderstanding often follows caused by insufficient knowledge of the customs and practices of the other. As a colony, New Zealand set out with more respect for its indigenous people than did most colonies had. However, as this narrative shows, the New Zealand record was not perfect as greed for more land and unwillingness to learn more about indigenous culture led to conflict and loss of mutual trust. The first skirmish of the New Zealand Wars was the 1843 Wairau Affray at the north end of the South Island. It was an isolated incident caused by the Nelson settlers trying to seize land they did not own, an illegal vigilante action that resulted in twenty-two of them being killed. The Flagstaff War took place in the far north of New Zealand, around the Bay of Islands, in March 1845 and January 1846. This was about mana—tribal prestige—and customs duties. It was really a war between rival Māori chiefs, with the British fighting on one side for the prestige of the British Empire. This was followed almost immediately by the Hutt Valley Campaign, March to August 1846, and the Wanganui Campaign, April to July 1847, in the south-west of the North Island. Both these conflicts were about the encroachment of the European settlers onto Māori land. The Maori, in the first three wars, proved to be resourceful and competent opponents. However, they had no wish to beat the British settlers or to drive them from New Zealand. From the engagements emerged an understanding: English law prevailed in the townships and settlements, and Māori law and customs elsewhere. There followed a period of relative peace and economic cooperation from 1848 to 1860. During this time, European settlement accelerated and in about 1859, the number of Pākehā came to equal the number of Māori, at around 60,000 each. By now, Pākehā had largely forgotten the painful lessons of the earlier conflicts. They tried to use military might to push through a very dubious land sale that one of their own courts later repudiated. The result was the First Taranaki War. Once again, the local British forces were more than evenly matched by Māori, and after twelve months both sides were happy to settle for a draw. However, this was clearly just a preliminary. The British settlers were not prepared to countenance Māori controlling and ruling most of the North Island. War broke out again in 1863, with the Invasion of the Waikato. The Waikato War, including the Tauranga Campaign, was the biggest of all the New Zealand Wars. The outcome of this war was the major confiscation of Māori land, which quickly provoked the Second Taranaki War. By the mid 1860s, the conflict had forced the closing of all the native schools. The period from the second half of 1864 until early 1868, was relatively quiet. Possibly the most notorious incident during this time was the murder of the missionary Carl Volkner. There were also two serious intra-tribal conflicts, civil wars in Māori tribes, between adherents and non-adherents of the Pai Marire or Hau Hau sect—a vehemently anti-Pākehā religious group which was intent upon destabilizing the developing cooperation between the Māori and Pākehā. These are sometimes known as the East Cape War, but that label oversimplifies a complicated series of conflicts. The last major conflicts were Te Kooti's War and Titokowaru's War. These were fought at the same time but were not related to each other and should be considered as separate conflicts. This virtually ended the major, violent conflicts between the new colonial government and the original occupants of the land. There were subsequently other conflicts and incidents that were a part of the overall conflict, but are not usually seen in the context of the New Zealand Wars. The invasion of Parihaka, in 1881, was certainly one of these. There was an incident in the 1890s that became known as the Dog Tax War. Another was the arrest of Rua Kenana in 1916. It is even possible that events at Bastion Point, in the 1970s, should be considered as part of the same scenario. In 1859, the Europeans in New Zealand reached numerical parity with Māori, at about 60,000 each. However neither population was stable. The Māori population was declining so fast that some people saw their extinction as a distinct possibility. Meanwhile, immigrant ships were arriving from Britain on an almost weekly basis. As early as 1841, one Māori asked if the whole British tribe was moving to New Zealand. There were other inequalities. The imperial troops were supplied and paid for by Britain and not by the fledging colony. So Māori were fighting against the economic base of industrial Britain. On the other hand, Māori had an agrarian economy—their warriors were also their farmers and food gatherers. As such, they were limited to periods of only two or three months of campaigning each year before they had to return to their home base. They developed a system of rotating shifts for the longer conflicts, but were never able to deploy their entire force. The Invasion of the Waikato was, by far, the largest conflict. The colonial side mustered some 18,000 men, with a peak deployment of possibly 14,000. Opposing them were 4,000 to 5,000 Māori, of whom only about half were actively involved at any one time. There were always Māori on both sides of the conflict—fighting for and against the British. In the Flagstaff War, the Māori allies were wholly independent of British command; Tāmati Wāka Nene was at war with Hone Heke. Indeed, the only really serious engagement of the war, the Battle of Waimate Pa, where the two forces met and fought with determination, did not involve the British at all. By the 1870s, in Te Kooti's War, there were Māori fighting as part of the colonial forces. Ngāti Porou formed their own regiment. In the latter stages—the hunt for Te Kooti through the Urewera Ranges—some incidents were once again Māori fighting Māori. Usually though, Māori fought as allies, not as subordinates. When their interests diverged from Pākehā interests, they tended to go their own way. Māori were fighting Pākehā. They too can be divided into two groups. One was the British imperial forces — the combined forces of the British Empire, including Australians going overseas to war for the first time. The other consisted of the various militia formed from the settlers, answerable to the New Zealand government, not to London. (These units eventually evolved into the New Zealand Army). The first war was fought by imperial forces, probably assisted informally by a few settlers. The Taranaki War involved organized units of settler militia. The British government was increasingly reluctant to become involved in New Zealand wars. To get its support for the invasion of the Waikato, Governor George Grey had to present a false picture of the seriousness of the situation to the Colonial Office in London. What became known as the Second Taranaki War was basically the reaction of the Māori to the wholesale confiscation of their land by the colonial government, which originally used imperial troops for this, but the commander, General Duncan Cameron, resigned in protest. In 1870, the last British troops were withdrawn from New Zealand; this was in line with both the “self-reliant" policy of Premier Frederick Weld and the Cardwell reforms of the Army in Britain. There were a few British settlers who fought for Māori; not many, but there always were some arrivals in New Zealand who identified completely with Māori. They were known as Pākehā Māori, meaning strangers who have become Māori. Perhaps the most well-known was Kimball Bent, who acted as Titokowaru's armorer and later became a noted tohunga (priest). The British Army were professional soldiers who had experienced fighting in various parts of the Empire, many from India and Afghanistan, although front line units were never sent (in contrast to, say, South Africa or other parts of the Empire). They were led by officers who were themselves trained by men who fought at Waterloo. The Māori fighters were warriors from many generations of warrior—survivors of the Musket Wars, twenty years of bitter inter-tribal fighting. One of the reasons for the First New Zealand War was curiosity by the Māori warriors to see what kind of fighters these Pākehā soldiers were. Both sides found their opponent's way of waging war totally incomprehensible. The British set out to fight a European-style war, one that had worked for them almost everywhere else in the world. When they find an enemy strong point or town, they attack it. The enemy feels obliged to defend the strong point. Either there is a battle, or they besiege and then capture the strongpoint. Theoretically, the British win and the enemy loses. Conversely, Māori fought for mana and economic advantage, originally slaves and goods or control of lands, and for the challenge of a good battle. The first British action of the Flagstaff War was the capture and destruction of Pomare's Pa near Kororareka. This was a substantial Māori settlement, so it seemed like a British victory, but all the Māori warriors escaped with their arms, so they did not see it as defeat. The British then set out to do the same to Kawiti's Pa at Puketapu. But this was not a residential settlement, it was a purpose-built strong point with only one objective; to invite attack by the British. It was several kilometers inland, across very difficult country—steep gullies, dense, bush-clad hills and thick, sticky mud. Getting there was a major expedition. The British troops were already exhausted when they arrived in front of the pa. The next day, they tried a frontal attack and discovered that the bush and gullies they were advancing through and across were full of hostile warriors. Some of the British troops reached the palisade and discovered that attacking thick wooden walls with muskets was not effective. After several hours of costly but indecisive skirmishing, the British withdrew. Fortunately for them, their Māori allies were able to feed them and they were not attacked by their Māori enemies on the retreat back to the coast. The attack on Puketapu Pa was typical of Māori-British warfare. Māori would build a fortified pa, sometimes provocatively close to a British fort or redoubt, and the British would feel they had to attack it. Their aim was always to bring Māori to battle where they knew they could inflict a decisive defeat. In European warfare, besieging an enemy fortress usually provoked a battle. However, Māori also knew that they would probably lose heavily in open conflict; this had been the result on the few times that it happened. Generally, they were successful in avoiding it. A Māori pa was not the same as a European fortress, but it took the British years to appreciate the difference—perhaps not until after the First World War. The word “pa” meant a fortified Māori village or community. They were always built with a view to defense, but primarily they were residential. Puketapu Pa and then Ohaeawai Pa were the first of the so-called “modern pa.” They were built to engage enemies armed with muskets and cannon. A strong wooden palisade was fronted with woven flax leaves (Phormium tenax) whose tough, stringy foliage took a lot of penetrating. The palisade was often lifted a few centimeters from the ground so that muskets could be fired from underneath it rather than over the top. Sometimes there were apparent gaps in the palisade, which led to killing traps. There were trenches and rifle pits to protect the occupants and, later, very effective bomb shelters. They were usually built so that they were almost impossible to surround completely, but usually presented at least one exposed face to invite attack from that direction. They were cheap and easily built—the L-Pa at Waitara was constructed by eighty men overnight—and they were completely expendable. Time and again, the British would mount an elaborate, often lengthy, expedition to besiege an annoying pa, which would absorb their bombardment and possibly one or two attacks and then be abandoned by Māori. Shortly afterwards, a new pa would appear in another inaccessible site. Pa like this were built in their dozens particularly during the First Taranaki War, where they eventually formed a cordon surrounding New Plymouth. For a long time, the modern pa effectively neutralized the overwhelming disparity in numbers and armaments. At Ohaeawai Pa in 1845, at Rangiriri in 1864 and again at Gate Pa in 1864, the British and colonial forces discovered that frontal attacks on a defended pa were both ineffective and extremely costly. At Gate Pa during the Tauranga Campaign in 1864, Māori withstood a day-long bombardment in their bomb shelters. One authority calculated that Gate Pa absorbed in one day a greater weight of explosives per square meter than did the German trenches in the week-long bombardment leading up to the Battle of the Somme. The palisade being destroyed, the British troops rushed the pa whereupon Māori fired on them from hidden trenches, killing thirty-eight and injuring many more in the most costly battle for the Pākehā of the New Zealand Wars. The troops retired and Māori then abandoned the pa.
British troops soon realized an easy way to neutralize a pa. Although cheap and easy to build, a modern pa did require a significant input of labor and resources. By the wholesale destruction of the Māori economic base in the area around the pa, causing the destruction of tribal society, they were sometimes able to render them unaffordable. This was the reasoning behind the bush-scouring expeditions of Chute and McDonnell in the Second Taranaki War. However, the biggest problem for Māori was that their society was ill-adapted to support a sustained campaign. The Māori warrior was a civilian part-time fighter who could not afford to be away from home for too long. The British force consisted of professional soldiers—although hardly the front line of the Empire of the day—supported by an economic system capable of sustaining them in the field almost indefinitely. While the British found it difficult to defeat Māori in battle, they were able to outlast them in war. The two final New Zealand Wars, those of Te Kooti and Titokowaru, present an interesting contrast. Titokowaru used the pa system to such devastating effect that, at one stage the New Zealand government thought they had lost the war (see Titokowaru's War). Te Kooti, on the other hand, was an effective guerrilla leader, but showed little or no skill in fighting from a fixed position. He had ill-built pa, inadequately supplied, and he held on to them for too long. Te Kooti's War ended due to his defeat at Nga Tapa and Te Porere. Large areas of land were confiscated from Māori by the government, under the New Zealand Settlements Act in 1863, supposedly as punishment for rebellion. In reality, land was confiscated from both "loyal" and "rebel" tribes alike. More than four million acres (16,000 km²) of land in total was confiscated. Although about half of this was subsequently paid for or returned to Māori, it was often not returned to its original owners. The confiscations had a lasting impact on the social and economic development of the affected tribes. The legacy of the New Zealand Wars continues, but these days the battles are mostly fought in courtrooms and around the negotiation table. Numerous reports by the Waitangi Tribunal have criticized Crown actions during the wars, and in one instance, found that Māori too had breached the Treaty. The Crown has conceded that aspects of the warfare and confiscation breached the principles of the Treaty of Waitangi, and apologized for its actions in relation to Waikato TainuiTaranaki and Bay of Plenty tribes, as part of negotiated settlements of these tribes' historical claims. ↑ Waitangi Tribunal, Turanga Tangata Turanga Whenua: The report on the Turanganui a Kiwa claims. Retrieved September 24, 2008. ↑ New Zealand Legislation, Waikato Raupatu Claims Settlement Act 1995 No 58. Retrieved September 24, 2008. Barthorp, Michael. 1979. To Face the Daring Māori. London: Hodder and Stoughton. ISBN 9780340227190. Belich, James. 1988. The New Zealand Wars and the Victorian Interpretation of Racial Conflict. Auckland, NZ: Penguin. ISBN 9780140111620. Belich, James. 1996. Making Peoples. Honolulu, HI: University of Hawai'i Press. ISBN 9780824818906. Binney, Judith. 1995. Redemption Songs: A Life of Te Kooti Arikirangi Te Turuki. Auckland, NZ: Auckland University Press. ISBN 9781869401313. Buick, T.L. 1976. Old Marlborough. Christchurch: Capper Press. Cowan, J. and P.D. Hasselberg. 1983. The New Zealand Wars. Wellington, NZ: New Zealand Government Printer. Volume 1 1845-64. Retrieved September 24, 2008. Volume 2 1864-72. Retrieved September 24, 2008. King, Michael. 2003. The Penguin History of New Zealand. Auckland, NZ: Penguin Books. ISBN 9780143018674. Lee, Jack. 1983. I Have Named it the Bay of Islands. Auckland, NZ: Hodder and Stoughton. ISBN 9780340338780. Lee, Jack. 1987. Hokianga. Auckland, NZ: Hodder and Stoughton. ISBN 9780340401187. Maning, Frederick Edward. (1862) 1999. A History of the War in the North of New Zealand against the Chief Heke. Christchurch, NZ: Kiwi Publishers. ISBN 9781869642679. Maxwell, Peter. 2000. Frontier, the Battle for the North Island of New Zealand. Auckland, NZ: Celebrity Books for Waitekauri Pub. ISBN 9781877252037. New Zealand History Online. Treaty of Waitangi. Retrieved September 24, 2008. New Zealand Legislation. Waikato Raupatu Claims Settlement Act 1995 No 58. Retrieved September 24, 2008. "The People of Many Peaks: The Māori Biographies." 1990. From The Dictionary of New Zealand Biography, Vol. 1, 1769-1869. Wellington, NZ: Bridget Williams Books and Department of Internal Affairs. ISBN 9780046410520. Pugsley, Chris. 1998. Manufacturing a War: Grey, Cameron and the Waikato Campaign of 1863-4. Simpson, Tony. 1979. Te Riri Pākehā. Martinborough, NZ: Alister Taylor. ISBN 9780908578115. Sinclair, Keith (ed.). 1997. The Oxford Illustrated History of New Zealand, 2nd edition. Wellington, NZ: Oxford University Press. ISBN 9780195583816. Stowers, Richard. 1996. Forest Rangers: A History of the Forest Rangers During the New Zealand wars. Hamilton, NZ: Richard Stowers. ISBN 9780473035310. Vaggioli, Dom Felici and J. Crockett trans. 2000. History of New Zealand and its inhabitants. Dunedin, NZ: University of Otago Press. ISBN 9781877133527. Walker, Ranginui. 1990. Ka whawhai tonu matou: Struggle Without end. Auckland, NZ: Penguin. ISBN 9780140132403. Waitangi Tribunal. Turanga Tangata Turanga Whenua: The report on the Turanganui a Kiwa claims. Retrieved September 24, 2008. The New Zealand Wars / Nga Pakanga Whenua O Mua. Scholarly and comprehensive website run by Professor Danny Keenan of Victoria University of Wellington, NZ. New Zealand's 19th Century Wars NZHistory.net.nz. New Zealand Wars (1845–1872) collection at the Victoria University of Wellington. The Maori Wars 1966 Encyclopaedia of New Zealand. History of "New Zealand land wars"
This page was last modified on 21 November 2018, at 17:06.